I love everything apple and will eat apples just about any way that you find them. I love to use wild and free apples when ever I can to make treats for the family but one treat I love more than most is hand pies. Some southern families make these small fried pies with biscuit dough others with smashed Wonder Bread and mine are made with frozen white bread dough. All of them have a freshly made filling, some sweet some savory, and all are fried to a deep golden brown on the stove top while the little ones watch. Hand pies have been made in the South for generations and no one ever turns one down. The pies are eaten hot and served as dessert, breakfast or as an after school snack. Often the fillings for the pies are whatever a southern mother had left over from a family dinner. 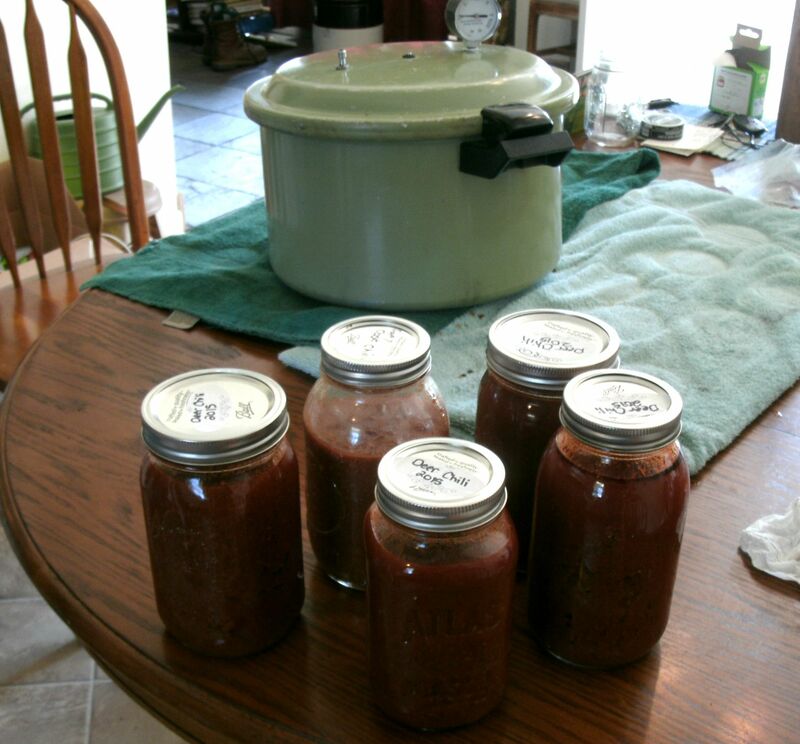 Apple sauce, peaches, raisins, even savory pies would have left over roast and veggies. My mother in law would often make then with white bread in a pie maker with home canned pie fillings. The neighbor kids could smell then 1/2 mile away and knew what she was making and pray she would make them one! I personally have not invested in a pie maker of any kind although they seem to make great pies and bind the edges together very well… less of the filling leaking out is always a good thing.I just use my fingers to roll the bread dough together. The edges are a little more individual but they rarely leak. So to make my version of an Apple Hand Pie, I start with a frozen bread dough for dinner rolls and place them out to thaw. 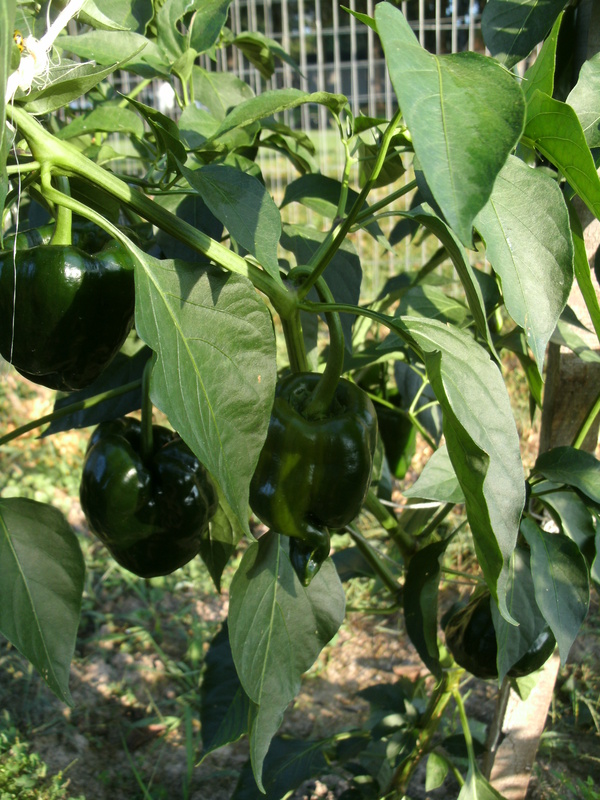 I also peal, core and dice two or three snake size apples. The apples in these photos are Gala but you can use just about any apple that will not turn to mush when cooked. I dice the apples into a skillet with two teaspoons of butter and cook over med heat for 3 or 4 minutes.Adding brown sugar, cinnamon , and a little water to the hot apples. I let the water cook down until the sauce is thick and sticky. With some apples no water is needed to soften the apples,they provide enough juice to cook down the apples with out scorching.I had to add water to cook them until they were soft around the edges. I let the filling cool while rolling out the dough. Each dinner roll makes about a 5 inch circle with a little tugging and rolling. I put about two table spoons filling on half the pie crust and fold over the warm apple filling. I squeeze the edges together then roll them upward and roll up the edge with a pinch at the end of the pie. I then fry the pies in hot oil about 325 to 350 degrees just long enough for the pie to float and turn brown on both sides. The dough is thin and gets crispy fast. I make two pies at a time. Draining them on paper towels and topping with a dollop of butter and a pinch of cinnamon sugar. Let cool slightly before eating or cutting open to share. One bag of frozen dinner rolls.. I make two per person. 3 small snack size apples per 3 people Gala, Winesap, Red Delicious work well. 3 Tablespoons salted butter.One used to add to cinnoman topping. 1/2 teaspoons cinnamon and a dash of nutmeg. A friend sent this to me on Face Book just a few days ago. It makes me wonder how many of us really understand how foraging can help control evasive plants. It also made me want to share this with any one who likes foraging for greens. Wild Garlic Mustard is found growing almost everywhere in the Eastern US and can be cooked and eaten like any other bitter green. Another green that is problematic in our area and across the south is Stinging Nettle. Hardy and fast spreading by seed if given the right growing conditions these plants crowed out natural flowers and plants . Animals do not like the smell or taste of the Garlic Mustard or Stinging Nettle so they are not controlled by the environmental conditions . If you are in the West Virginia area and have time to help with this problem and enjoy the outdoors and cooking free wild food we could use your help. My family hopes to attend one of these pulling dates and make a nice side dish of Garlic Mustard Cakes when we get home.A dish made from boiled greens drained to remove bitterness, eggs for a binder and Italian bread crumbs fried in brown butter. 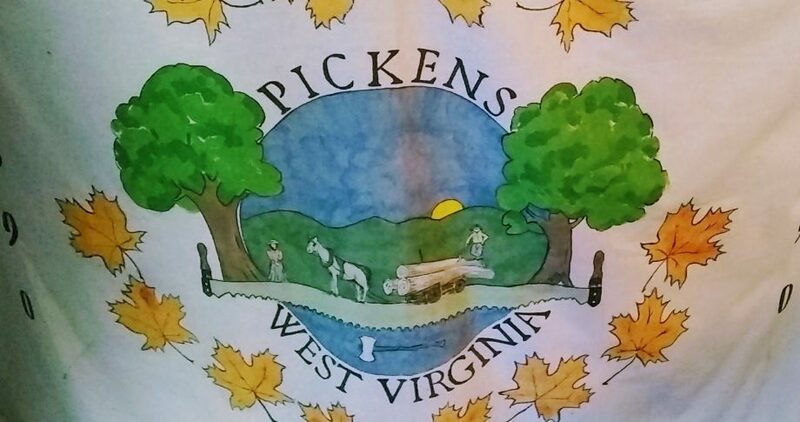 April and May is prime pulling time before the plants start to seed and West Virginia could use all the pickers we can find. We are allowed to take home as much of the Garlic Mustard as we wish but they would love for us to remove some of the plants also. For ideas on how to cook the wild greens follow this link Cooking Mustard Garlic. Hope to see you in the woods picking this spring. One of the things that I love best about West Virginia is our lack of dependence on the commercial food chain. It takes time to learn how to make delicious meals with wild game, but I would not live any other way. We have been very fortunate over they years to have found some really wonderful hunting locations that supply my family with lots of wild turkey every spring. I even tried to hunt a couple of days this year, even in the cast. 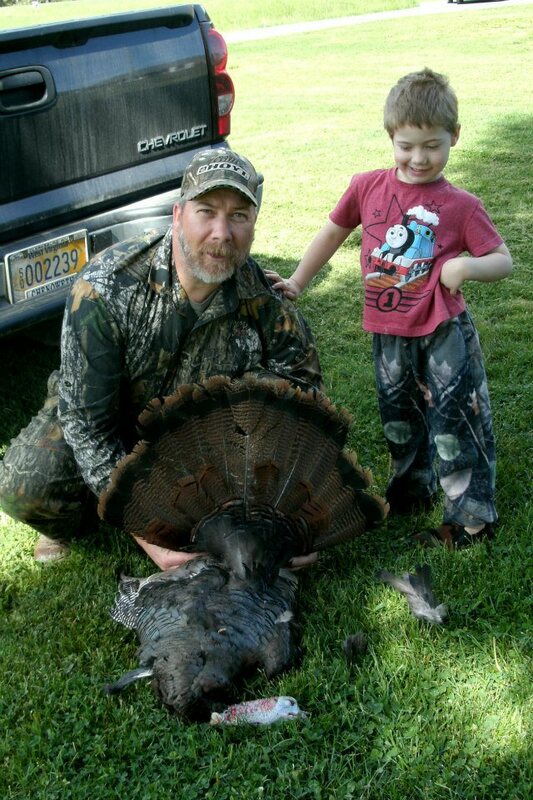 Tom and I never even saw a turkey those days, but he was lucky to fill his tags for the spring. 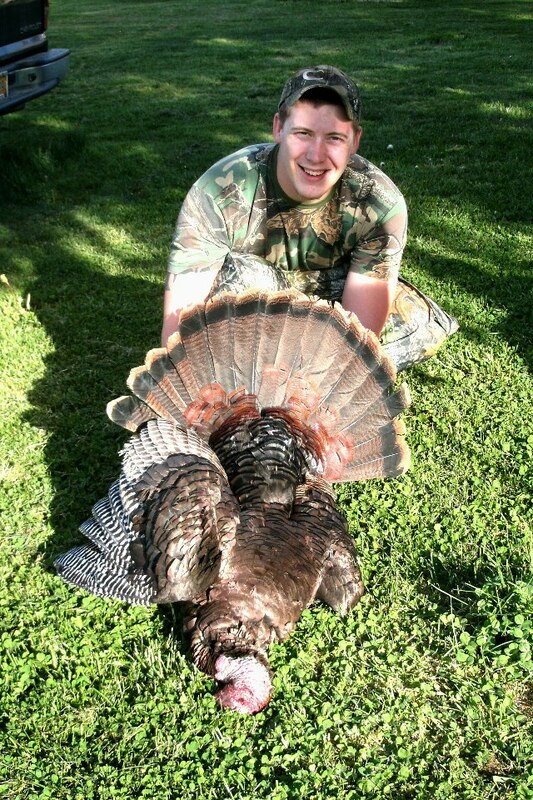 Cody my oldest son was not able to go this spring as he was moving but this is a nice bird from last season. On average the birds weigh about 15 to 18 pound uncleaned and we get around 6 to 8 pounds of white breast meat per bird. The legs and thighs are for making poultry stock and any thing with a diced meat like pot pie. The the dark meat from the legs and thighs is tougher than their domestic counter parts. They actually have to scratch, hunt and peck for their food so those legs have to work a lot harder than those white birds. So after we clean and butcher the turkey we are left with two large breasts. Usually they are to large for just Tom, Christopher and I to eat all in one meal. We either invite friends over or some times when we are in a rush I just toss a whole breast in the slow cooker and use the left overs for another nights meal. Once a person eats well cooked wild turkey there is rarely a person who goes back to domestic turkey. Wild turkey is not dry and is not so pumped up on steroids so the meat is not as thick so it cooks more evenly. 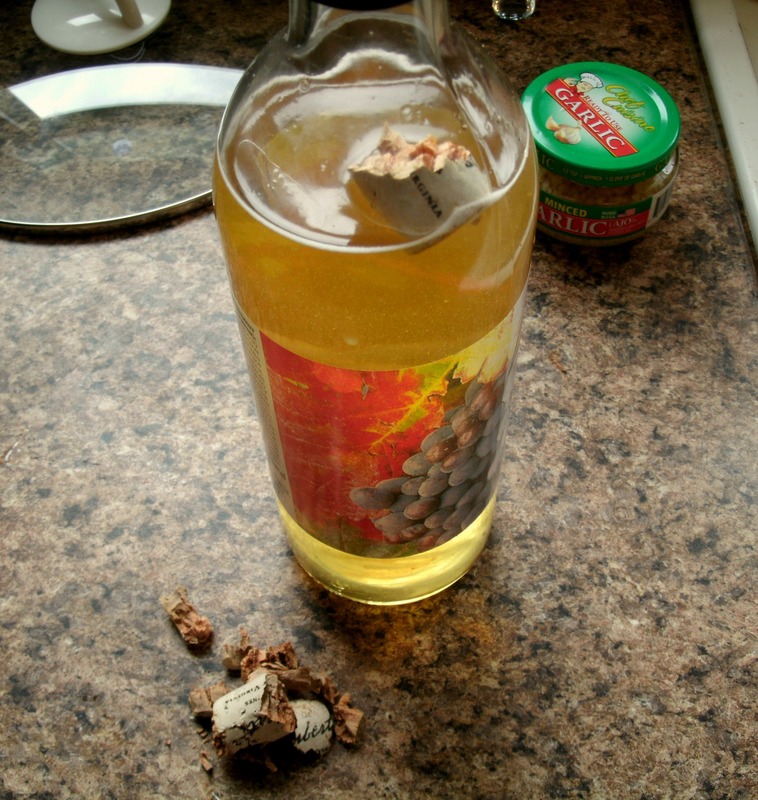 This means that seasoning and marinades penetrate the meat more fully. In my case we make a soup stock to cook the turkey in and then thicken the broth at the end for a pan sauce with all the flavors you cooked the turkey in. I like it over mashed potatoes just like gravy. 1. 5 to 6 pound wild turkey breast off the bone. 3. 1/2 med sweet onion..
4. 2 teaspoons minced garlic. 5. 2 teaspoons celery flakes ( do not like eating celery so I opt for the flakes if you have fresh celery use about 1/2 cup). 6. 1 teaspoon poultry seasoning. 8. 1 cup white wine. 9. 2 bullion cubes in two cups water or two cups chicken stock. 10. 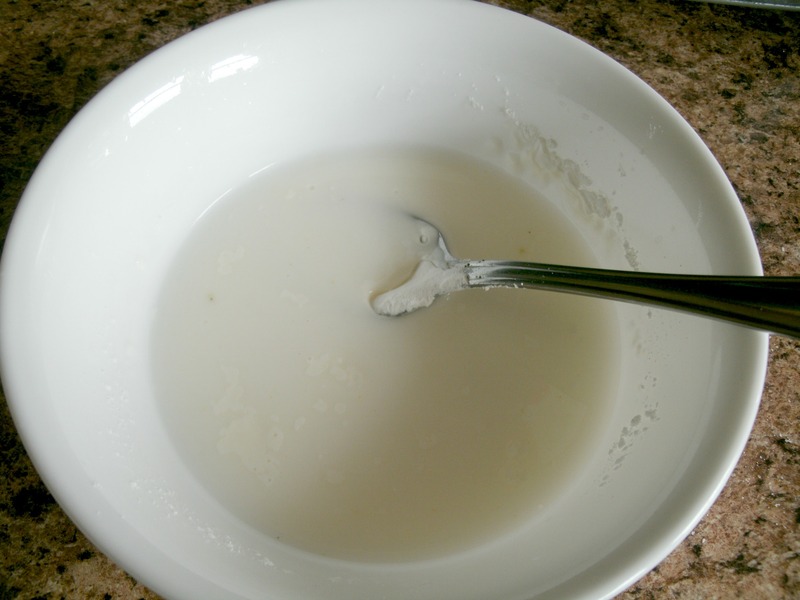 1/4 cup corn starch and 1/2 cup water to make as a thickener for sauce. 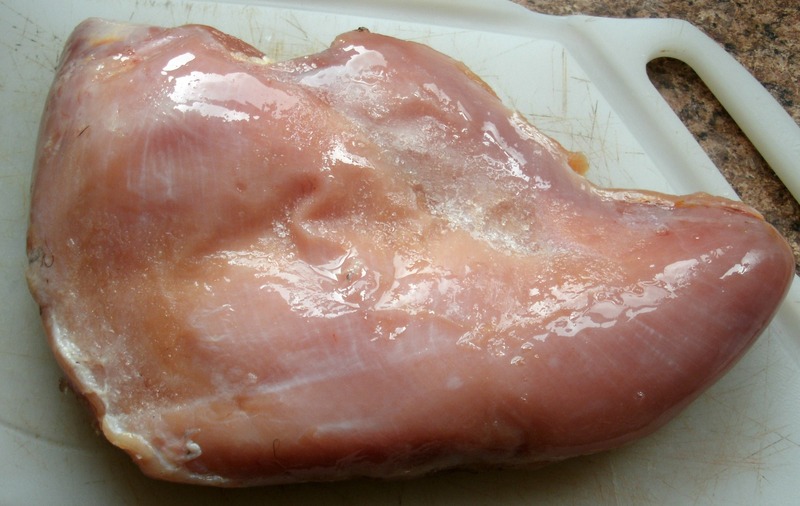 Starting with the turkey breast, remove any pin feathers, fat or connective tissue that remains after butchering. 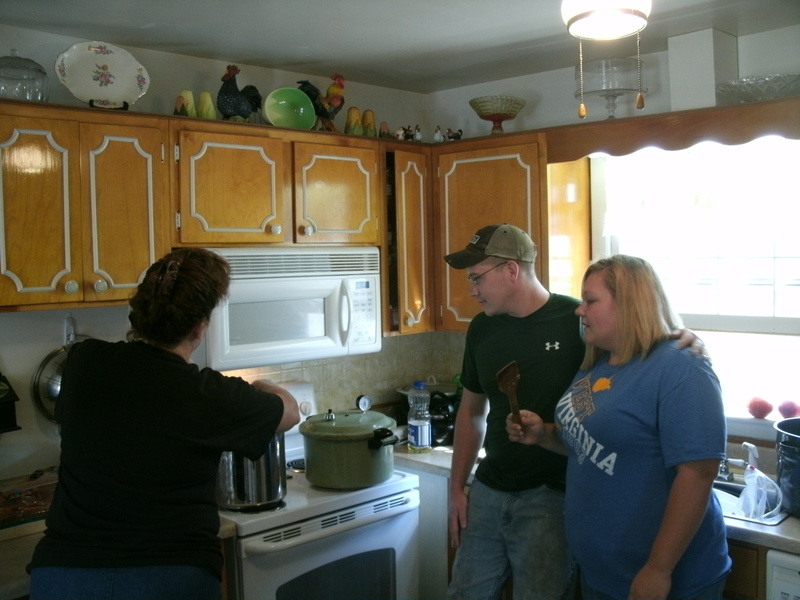 Set a side as you prepare the broth that the breast simmer in. When finished cleaning the breast, I make what will be a traditional chicken soup starter. 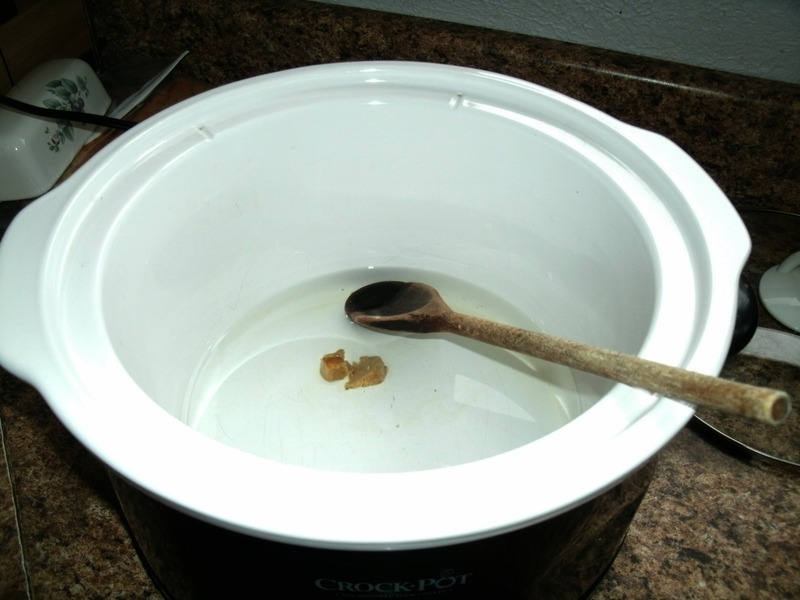 I start with heating up the slow cooker adding my water and bouillon or stock to the cooker. 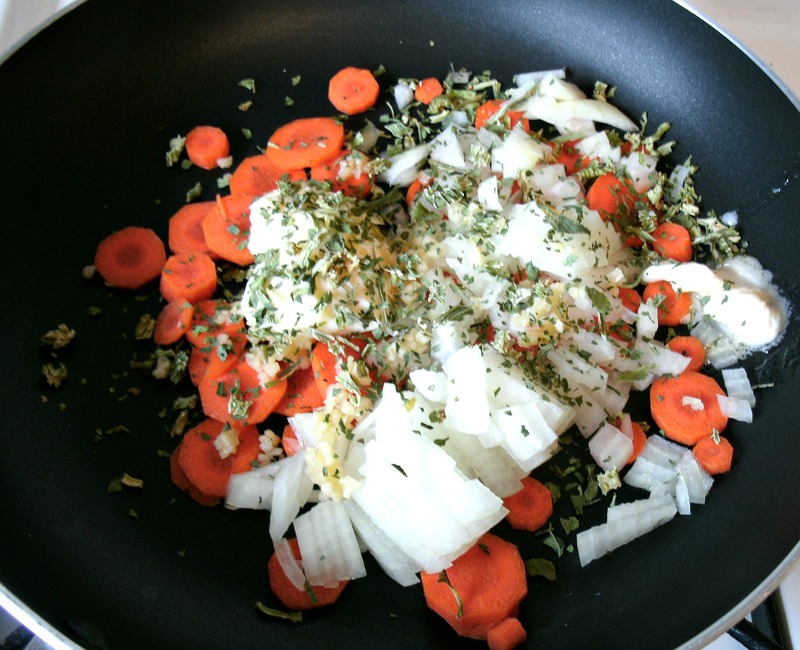 Next I saute’ the remaining items on the above list until the onions are translucent and the carrots and garlic are soft. Slowly adding in the wine as the mixture softens. I let everything simmer together for couple of minutes and then add all of this to my warming stock. At this point I taste the broth and adjust salt and pepper. I usually add a little salt at this point.Then add the breast and cover with the cooker lid and simmer two hours adding wine or water if the broth is boiling away to quickly to keep the breast moist. I like to have the broth reach up about half way up the side of the meat. 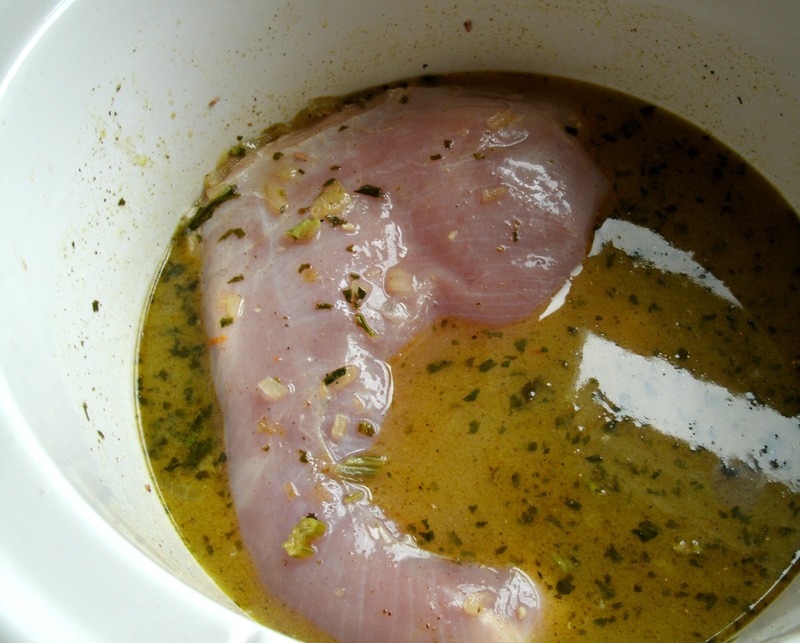 I let the breast cook another 3 hours and check for tenderness and doness. I try to pick the breast up with a serving fork and if it is ready is will not stay together well enough to use a fork alone. It will begin to fall apart. I then turn off the slow cooker and let it sit a few minutes. As it cools and I begin to thicken the broth on the stove. I place a small pan on the stove with 2 teaspoons corn starch mixed with about 1/4 cup water. Then I ladle about 1 1/2 cups of broth out of the stock pot into the sauce pan and heat over med-low until the sauce begins to thicken. 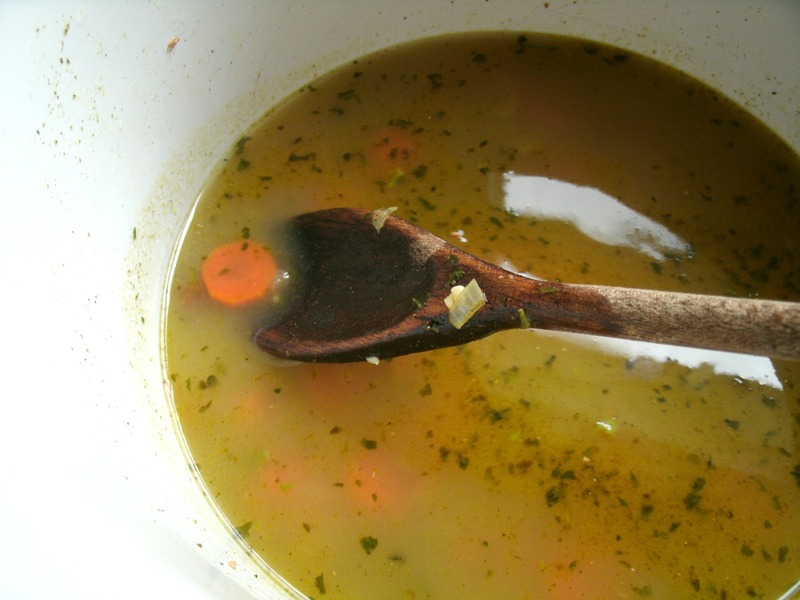 Making a sauce with a nice chicken noodle soup flavor. 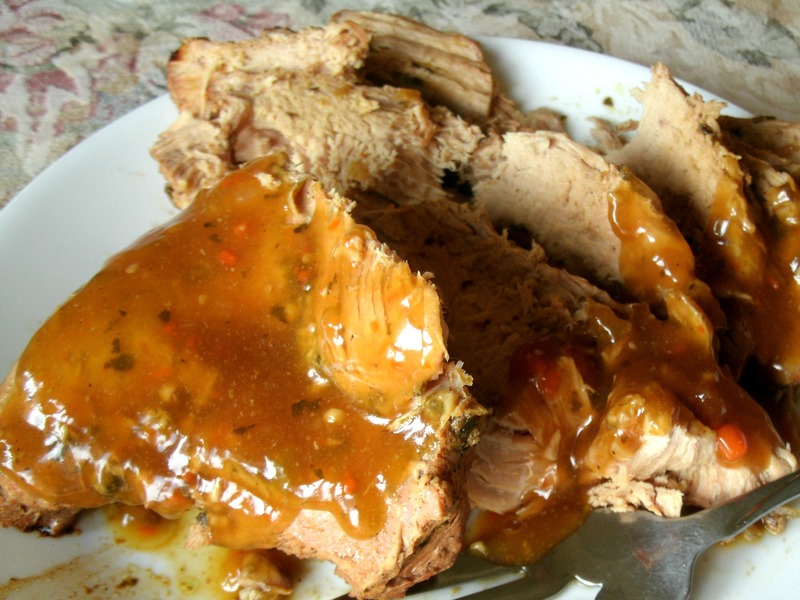 I then remove the breast from the slow cooker, cut thin slices and drizzle with sauce. 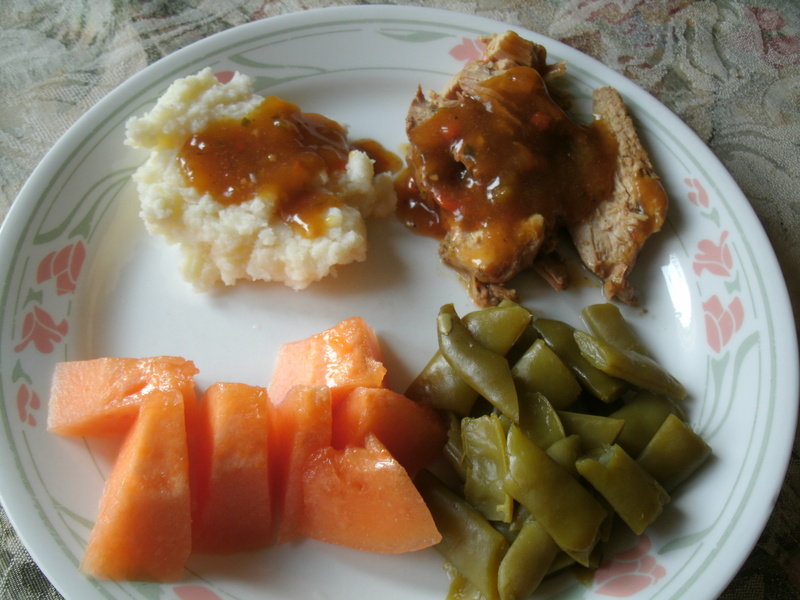 We served this with southern side dishes of mashed potatoes, seasoned green beans with bacon and fresh cantaloupe. Just as a funny side note as I was cooking I needed to open another bottle of wine for this recipe and got the cork screw out as the veggies were cooking away and tried to open the bottle. Well in all of my years of drinking and cooking with wine I have never ever had this happen. No mattered what I did, the cork screw just slowly descended into the cork and would not grip the cork. I lowered the handles and nothing happened. The screw just popped out and the cork just sat there with chunks of cork falling all over the counter. What a mess, I tried again and the mess just got bigger. 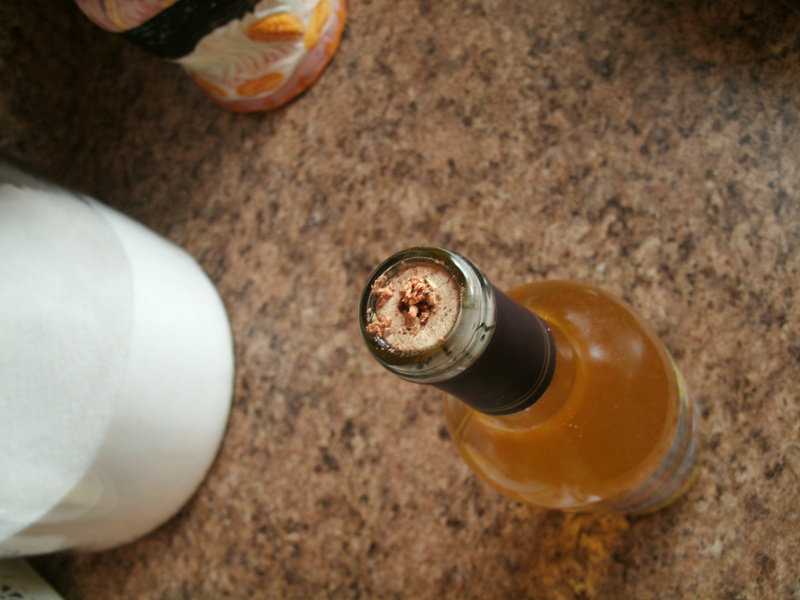 I then got desperate and just tried to pry the cork out with a knife. A mistake I know, but my dinner was going to burn and I needed to get the darn things open! Any suggestion on what to do if I face this situation again? Maybe I will just go with Wild Turkey in the bottle instead of wine and make a double wild turkey dinner in stead.